So I have really been enjoying trying out some new foot creams lately. My feet are feeling and looking SO much better now then they were before. I have also enjoyed sharing my experience with my family and also with you all right here on my blog! I know that I am not the only woman on the planet with dry and cracked heels. It actually didn't used to bother me until I noticed (and felt) exactly how awful they looked. It had never occurred to me that wearing sock-less footwear could have such a dramatic effect on my skin. During the winter months, I tend to wear slippers that are like flip flops and in the summer, I switch right into my summer time flip flops. So, my heels take a nasty beating. Proper foot care is so important...whether you are a man or woman, you cannot afford to not care about your feet. In my search for solutions to my cracked heels, I ran across a company that specializes in heavy-duty foot and hand creams...especially for those of us who really suffer from feet issues. 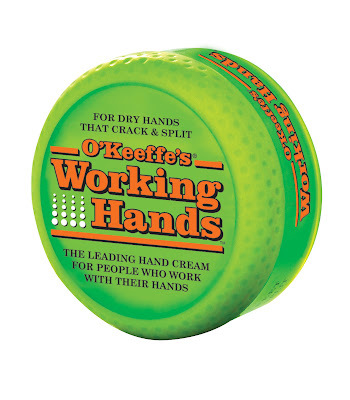 O'Keeffe's makes creams called Working Hands and Healthy Feet and yes, these products are designed specifically for the feet and hands. I have always loved working with my father on small projects. One thing that I have noticed as long as I can remember, dad has very rough and cracked hands. His hands often bleed and are painful to use. With him being as industrious as he is, this is very bothersome to him. Well, I have been talking to him about O'Keeffe's and as it so happens, he has recently been using their Working Hands cream! 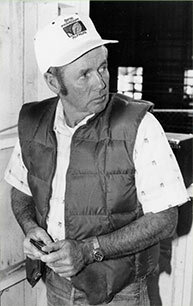 Here is a bit more about O'Keeffe's and the man who started it all...Bill O'Keeffe! Our story is a good one, so we can't help but tell it. The roots of O'Keeffe's Company go back more than 25 years to an arid region on the California-Oregon border known as the Klamath Basin. Bill O'Keeffe was a rancher who loved working with his hands. The tough lifestyle, however, took its toll on his hands and feet. The day-to-day act of working with his hands in an arid climate dried his hands and cracked his feet to the point that he could hardly shake hands, and it was painful for him to walk. With his daily work dependent on his hands and feet, there was never enough time for them to heal. Feeling helpless due to her father's constant pain and frustrated by the ineffectiveness of over-the-counter and prescription treatments, his daughter, Tara, was driven to find a way to relieve her father's suffering. Up to that point, nothing seemed to promote the healing of his split, cracked and damaged skin. Applying her skills as a pharmacist, Tara and her father spent years creating and testing various formulations mixed in her kitchen, until, many years later, she discovered a skin care product that actually helped the healing of her father's damaged skin. This was the basic formula for what has become O'Keeffe's Working Hands. Their dogged-determination resulted in a product that allowed him a better quality of life, and it has since expanded into a booming business helping others with severe skin issues. O'Keeffe's Company promises guaranteed relief from painful cracks and splits in the skin of your hands and feet, and a product more effective than anything the giant cosmetic companies could conceive of. What started out as a product to help severe cracked and split skin, has since expanded into relief from various additional skin ailments. We have people writing in daily about the relief that O'Keeffe's has brought them from eczema, dermatitis, and more. We are dedicated to developing skin care solutions that work as hard as you do. O'Keeffe's Company is a family owned business. The company proudly carries on the tradition of family owned businesses that have always been the backbone of American communities. This is a really great story and one that shows the love that a father and daughter can share. One thing that I learned in reading this is that people have shared success stories about treating Eczema and other skin issues. My daughter suffers from Eczema and I am excited to try this cream on her to see if it works as well as they say it does. So, for this review I was sent a tub of Working Hands and also a tub of Healthy Feet cream. I was looking forward to trying these out and seeing the results! The first product that I tried was the Healthy Feet cream. This cream is kind of crumbly and has no fragrance whatsoever. It is white in color and light in feel. Honestly, I absolutely LOVE the containers. They have a rubber rim on them so you can easily close them when you are finished applying your cream. Normal lids become slippery and they are difficult to close. This is a great idea and every time I close my containers I always say to myself "I just love these lids!". So, all you do is apply a small amount of cream to your heels and any other areas of your feet that you wish. It is light, like I said before and so you may think that you need to use alot. But, a little goes a long way so you are fine with a little. I typically apply my foot cream at night and then put a pair of socks over top so it doesn't rub off and this is actually how O'Keeffe's recommends you apply it...at night. It also gives your body a chance to heal and revitalize the skin. I have used this cream steadily for about 4 days now and do notice a significant difference in my feet. The cracks are not as scratchy and they actually seem to be healing. I am very pleased with the results and will continue to use Healthy Feet! I also tried the Working Hands cream and thought that this was a fantastic product as well. For me, it didn't absorb quickly because I used too much. Ooops. Well, lesson learned. This cream did feel like it really coated my skin well and I can see how it would fill cracks and help to smooth hands. My hands do get really dry because I am constantly washing them so this cream is great to use after having my hands in water. I feel so badly for people who suffer with severe cracked hands...but now, there is help for them with O'Keeffe's! Both the Working Hands and Healthy Feet are Glycerin based and also contains Allantoin, an odorless, non-toxic and non-allergenic skin-protectant derived from the Comfrey plant. It removes dead skin cells to allow for better penetration and absorption of moisture and moisturizing ingredients. This sounds so great! You can purchase both of these products as mass retail stores and also at hardware stores. Check out their store locator to find a store near you! Retail price is $7.99. So, in my opinion...O'Keeffe's Skin Creams are fantastic! I am thrilled with the results of the Healthy Feet cream and highly recommend it to anyone who suffers from rough, calloused or cracked skin on their feet. The Working Hands cream has been great for my father and I am glad that he finally has a solution for his painfully cracked hands. I would definitely recommend this top-of-the-line company to anyone and everyone!! O'Keeffe's has offered to give 5 of my readers one tub of each of these products! YAAAY! So, 5 of you will win Healthy Feet and Working Hands! Here are your entry options into this fabulous giveaway...thanks to O'Keeffe's for their generosity! Disclaimer: I received no monetary compensation for this post. I did receive free O'Keeffe's products for review purposes. All quotes and stock photos are from the O'Keeffe's website and email. Prize is being provided and shipped by the sponsor. All thoughts and opinions are 100% mine. I learned that you should apply 2-3 times per day, especially after showers. I'd love to get this for my husband. He's a mechanic and his hands are so beat up. His palms are so dried and very cracked. I learned they have a money back guarantee. Glycerin is a humectant which draws moisture to itself at a molecular level causing hydration of the skin. I learned that have an FAQ section and also have a newsletter. I learned that O'Keeffe's Working Hands can be used to help expedite the healing process on skin that has been sunburned, as well as skin that has been burned through exposure to chemicals or heat. I learned there is a store in Jewell, IA which is 7.9 miles away from our home. I learned they have a money back guarantee, which is awesome! I learned that O'Keeffe's for Healthy Feet contains a higher concentrated amount of Allantoin which is an FDA approved skin protectant. Allantoin helps the cream penetrate through the thicker skin on the feet. I think it's very cool that they have a satisfaction guarantee! I learned it's a 3 step process. I learned that they offer a money back guarantee. I learned that it has a money back guarantee! they put paraffin in the formulation to seal the product in. I learned: Healthy Feet also has a higher concentration of Allantoin to remove dead skin cells for better penetration and absorption of moisture and moisturizing ingredients through the tough, thick skin of the feet and dry heels. I think that is why it must work so good!!! I learned that Working Hands contains a high concentration of Glycerin that draws in and retains moisture which is necessary for skin to heal. I learned that they have money back garantee! I learned that the term working hands is a term to describe a product that is formulated specifically to heal skin that is dry, cracked and split. It has a minimum shelf life of 5 years, that's awesome! At their website, I learned only hydrated cells are capable of repairing themselves. apply 2 - 3 times per day if needed. I learned that they use glycerin as a primary ingredient. I learned that you should apply 2-3 times per day. It has a minimum shelf life of 5 years. Thanks for the giveaway. I learned their products are good even after being frozen. I learned that maintaining healthy feet not only feels great and keeps you active, but it also helps prevent other, more serious problems from developing. It stays good for 5 years. i learned Working Hands contains a high concentration of Glycerin that draws in and retains moisture which is necessary for skin to heal. I learned that their product is nontoxic and that using their products can help prevent future problems. I learned that their healthy feet cream is non-oil based and made with Glycerin. I learned that Working Hands was first introduced to the market in 1994. I learned that they have a money back guarantee! O'Keeffe's products have been tested to have a minimum shelf life of five years. If the cream appears to be slightly dried out, you can add a small amount of water to bring back the original consistency. They have a money back guarantee which is nice. I learned that if you have the cream on your shelf for a long time, and it seems to be dried out, you can add a small amount of water to bring back the original consistency. I learned that O'Keeffe's oil-free formula was developed by a pharmacist to stimulate the skin's natural healing process by attracting and retaining moisture to hydrate the skin. I learned they use glycerin as primary ingredient that does a much better job of drawing moisture in than oil, allowing your skin to heal from the bottom layer up.